The main drama of our times is not however the aggression that comes from the outside, but that mysterious process of self-demolition of the Church that’s reaching its end results, after being denounced for the first time by Pope Paul VI in his famous address at the Pontifical Lombard Seminary on December 7, 1968. This self-demolition is not a physiological process. It is an evil and there are people responsible for it. Those responsible in this case are the Churchmen who dream of substituting the Mystical Body of Christ with an new organism, subject to perpetual evolution with no truths or dogma. “Le Figaro”, a conservative newspaper noted for its moderation, dedicated its December supplement “Figaro Magazine” to the Secret War in the Vatican: How Pope Francis shakes up the Church: 11 pages, edited by Jean-Marie Guenois, considered one of the most serious and competent Vatican journalists. “Something seems to be reversing in the Church after the Synod on the Family of October 2014” - writes Guénois – and the accumulated evidence of this justifies our asking: Does the Church not risk facing a tempest at the end of 2015, after the second session of the Synod on the Family?” Guénois reveals the existence of a “secret war” among cardinals with no aim at gaining power. What is in progress is a battle of ideas, which has as its principle object, the Doctrine of the Church on the family and marriage. Inside the Curia Pope Francis has been accused of being autocratic in his management of power, which the French journalist sums up in the formula: “Quand il tranche, le Pape ne met pas de gants” (When the Pope decides he doesn’t use kid-gloves), but the real problem is his ecclesial vision, inspired and counseled by the most progressive currents in the Vatican. According to Guénois, three theologians define the new objectives: the German, Cardinal Walter Kasper, the Italian, Bishop Bruno Forte and the Argentinean, Archbishop Victor Manuel Fernandez. “It was this trio that triggered off a rebellion at the Synod on the Family!” Kasper, incidentally, is the battering ram for the admission of the divorced and remarried to the Sacraments, Forte is a supporter for the legalization of homosexuality and Fernandez is the leading exponent of the Peronist theology of the people. That Cardinal Burke’s worries are justified the supplement of the weekly “Il Venerdi di Repubblica” of December 27, 2014, demonstrates. 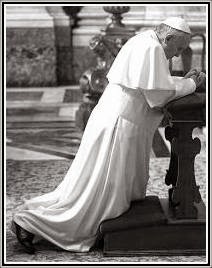 It was entirely dedicated to “An Inquiry on the Church”: 98 pages with 20 articles, wherein “the new era of Francis, among adversaries, saints, the persecuted and sinners” is described. Who can deny the existence of absolute confusion? 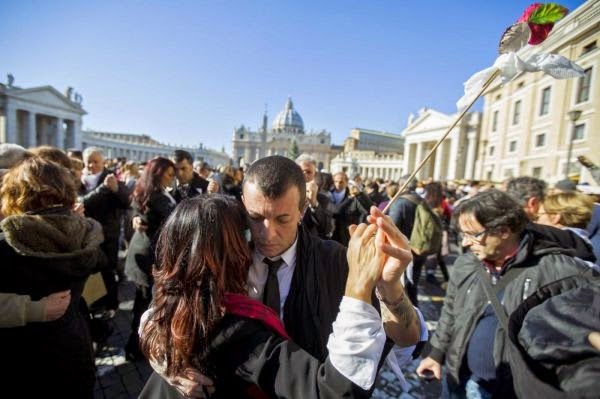 The tango danced in St. Peter’s Square on December17, 2014, for Pope Francis’ birthday, reminds one of another music: the one they were playing on the Titanic the night of the tragedy. Then however, the tip of the iceberg appeared suddenly, and the dancers were unaware of the imminent disaster. Today the iceberg is visible and there are those that are cheering for the impossible shipwreck of the Barque of Peter. 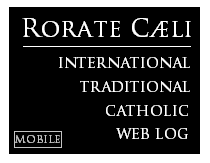 Many people though, are alarmed and have a strong sensation, as Cardinal Burke said, that the Church is a ship adrift. We are among them and for this reason we didn’t greet 2015 with dancing and fireworks, but with the firm decision of responding to Cardinal Burke’s appeal to fight, from today onwards until the next Synod - and beyond it - to defend the truth of the Gospel on marriage.